Red is known for its attractiveness and it draws every one's attention in a crowd. Research and surveys say that people who are outgoing and socially confident choose to wear red colors. 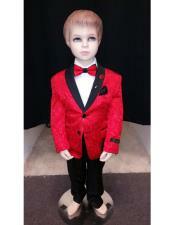 When it comes to boys, it looks dazzling when one wears a red suit because generally all prefer wearing the normal black and white suit and this red one will definitely make the wearer to look unique. 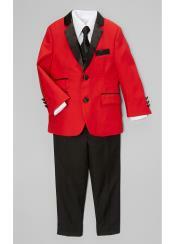 Many boys like to wear red suits as it represents enthusiasm and high level energy. Boys Red suits are preferred for many special occasions like weddings and other get together and it will be grand for father and son combination for a grand occasion. One must be little wise while selecting the quality of the suit because the color fades away in poor quality suits and the suit cannot be used any further. Another area in which one needs to take an extra care to look stunning depends on the choosing the appropriate accessories. Red is a dark color and so matching accessories should be selected that will not make the boy to look ridiculous. White as well as black pants can be worn with proper shoes to look dazzling.